The Web Education Community Group (CG) aims to evolve the Web and improve the overall skill set of the web industry by improving the quality of available web education resources and courses around the world. To do this, we are engaging in several activities, which are the responsibilities of different projects inside the CG: 1. Learning material: Creating a comprehensive series of tutorial articles to teach all the W3C technologies, which will constantly be updated so that it remains current and best practice. The main basis of this is currently the Web standards curriculum. 2. Curriculum: Creating a series of structured courses based on the learning material, which educators from around the world can use to teach web design and development in a consistent, effective way. 3. Outreach: Contacting educators, companies and trainers and getting them to adopt our learning material and curricula. 4. Training and certification: Training the trainers to help them teach web design and development more effectively, and formulating a plan to, and researching the feasibility of, partnering with them to provide W3C endorsed qualifications. 5. Membership and policy: Dealing with issues of membership and policy. 6. International Education: Different groups responsible for outreach and translations into specific languages to serve groups for whom English is not the primary language. For more information, follow the relevant links in the Pages list. Please note that the Web Education Community Group will not be developing any specifications. A workshop on evolving digital literacies and how to educate to the Web. Sharing experiences and developing community. 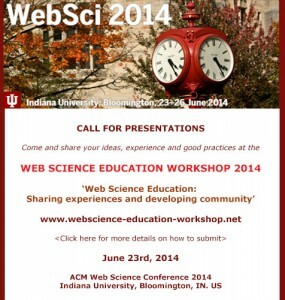 The Annual International Web Science Education Workshop will take place on the 23rd of June 2014 at Indiana University (Bloomington,USA) on the first day of the ACM Web Science Conference 2014. This workshop will allow participants to present experiences, good practices and ideas. A program committee will review 2 pages proposals and 2 pages position papers. Accepted proposals and papers will be presented in 5 minutes oral presentations during the workshop. The first goal of this workshop is to bring together researchers and members of the Web community involved in Web education: teachers, tutors, program coordinators, content designers and students, to have them present their programs, their courses, their teaching material and their experience with Web Science education. The second goal is the creation and design of a collaborative platform to manage information, resources, teacher’s training, exchange of students or teachers, events, etc. I’m Pieter Jansegers, a Frenchteacher from Flanders, the Dutch speaking part of Belgium. I’m already on the web since the very beginning of the WWW protocol, when the gopher protocol and ftp were still dominant. I’ve always been interested in informing people about the internet and the stuff going on online. My main focus right now is on microblogging on the one hand and MOOCs on the other hand. I would like to contribute with at least a couple of hours a week, when possible. I wish to help build a significant corpus of materials to spread web standards and web literacy and production across the world. I would like to know which are the most relevant/urgent tasks at the moment, or where can I find a list of projects to join in. To discuss contributions with participants, is the mailing list the prefered medium? Personally I think a forum would be friendlier and more efficient. I look forward to comments to this post to guide me through the way to contribute. I am Dolly Bhasin, a knowledge entrepreneur by choice. A gold medalist Electronics and Communications Engineer, I have specialisations in Business Administration and Sales and Marketing. With over 26 years experience in various aspects of ICT, I currently spend most of my time nurturing talent (youth and women) and enabing SMEs to adopt ICT in Business. The key purpose of my joining the W3C network community is to learn how to apply and adopt standards (specially semantic web and Indic web) in Tourism & Publishing Businesses. I would welcome the community to help me explore case studies, test cases, use cases etc. in my areas of interest and how I could help the local publishers/tourism industry to adopt these standards. Looking forward to exchanging notes. Few lines to introduce myself and my possible contributions to this group. So I’m a research engineer in big company (no link here since my participation to this group is a personal initiative). I’m working mainly on specialized search-engines for professional and as part of this I’m deeply impacted by web and semantic standards. I have few skills in the conception and development of web application consuming web data and including NLP, semantic processing and media processing. I also did a phd in interactive information retrieval where I learned some stuff on machine learning, user interaction and how to monitor and measure user engagement and experience. If I had to choose one contribution, that would be design recommendation to make a web application easy to exploit when one is willing to do either data scrapping and processing or simply user interactions and engagement monitoring. But I found about this group mainly through link to a “web standard reference” and contributing to this objective will be enough already. Hope I could give a hand on one subject or another. Just as a introduction my name is Nicolaas Bijvoet and I’m from Belgium. I, with my collegue Jill VandenDriessche, teach as a lecturer at a University College. We also co-founded, Belial.is a digital thinking-tank. Prior to lecturing we’ve been in the industry for the good part of a decade. Now as lecturers, we help students on their way in designing for the digital age. My expertise lies with designing cross channel experiences – concept, interaction design, prototyping and … well … design. I’m no developer, but I have a strong intrest in coding. I know my way aroud html, css, js Jill on the other hand is the master developer, with a very strong knowledge of html/css/js/php/java but keeps an eye open for good ux. Besides teaching we are involved in several research projects exploring possibilities in the ‘mobile’ sphere as wel as the so-called ‘internet of things’ sphere. We are looking forward to contributing, discussing and finding new and engaging ways to guide youngsters their way in this whole digital age. I’m Adam and I’m a web developer based in Oxfordshire. I currently work for the design agency One (oneltd.co.uk) and have been in the industry for nearly 3 years. I also work on some freelance and charity projects in my spare time as well as starting to develop my skills as a speaker/lecturer. I also write things at my site onishiweb.co.uk and have been part of the team organising and writing for the website 12devsofxmas.co.uk. I graduated from Oxford Brookes University in 2010 after completing a Computer Science degree and taking many modules that covered web design and development of which I think the standard was pretty low and very outdated. This was one of my main motivations for joining the Web Education Community Group with the aim of helping to improve the current state of Web Education in Universities and other higher/further education institutions. I recently gave a lecture at Brookes to the Web Design students about working in the industry and I have offered to help with delivering and improving their curriculum in the new year and the response from the lecturer there has been very positive.